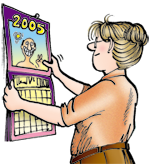 March | 2015 | FBorFW Strip Fix For Better or For Worse Comic Strip by Lynn Johnston. Lynn's Comments: Saying thanks was something I tried to hammer into my kids and now, my grandchildren. It's a simple word, takes no time to say and it means so much to the person who has done you a good service. Sadly it's something not heard enough. The other thing we should hear more often are the words "I'm sorry". This entry was posted in Uncategorized on March 1, 2015 by stripfix. Lynn's Comments: I had no idea how important it is for a horn player to maintain his/her teeth and mouth so as not to disturb the embouchure they have worked so hard to perfect. When my brother came to the clinic to have some work done on his front teeth, he was very nervous, hoping there would be no change. This entry was posted in Uncategorized on March 2, 2015 by stripfix. Lynn's Comments: I learned that "anticipation" was essential to four-handed dentistry--as it is to anything complicated and delicate requiring more than one person's skills. As a dental assistant, I had to know a procedure well enough to be able to anticipate the instrument or materials required before they were needed and to have them ready at precisely the right time. I also had to know when to suction, how to cut and fit those rubber thingies they use to keep stuff from falling into your mouth and to be able to prepare the gelatinous goo used to make moulds. Needless to say, as an untrained wife of the dentist, I made a number of annoying mistakes. Fortunately we didn't bark at each other over the head of a patient, whose trust we had to maintain. Nowadays, I don't think untrained assistants are allowed to help "chairside" unless the dentist is working with the Medical Missionaries in a third world country and there is no choice! I've done that, too. This entry was posted in Uncategorized on March 3, 2015 by stripfix. Lynn's Comments: This very situation brought my assisting career to an end. Dentistry is a fiddly business with many frustrating procedures. When my husband sharply asked for an instrument or for suction, I expected a polite "thanks" for my efforts, but he just carried on. His brusque manner wasn't personal--I just took it the wrong way! This entry was posted in Uncategorized on March 4, 2015 by stripfix. Lynn's Comments: When we moved to North Bay and set up a new clinic, we had two refrigerators--the one with the sandwiches was in the dining area. This entry was posted in Uncategorized on March 5, 2015 by stripfix. Lynn's Comments: Here again is the old chestnut where someone working outside the home has no idea how much work it is to manage a home and family. Every Friday, I look after my grandchildren. Laura is 3, Ryan is 1. Not wanting them to sit in front of the television for long, I try to have things for them to do--and it's a real effort. It takes time to interest them in toys, give them meals and snacks, keep them safe and keep them clean. You can do nothing else and if you try, you only get annoyed and resentful. Parenting is definitely a full time job! After a full day of serious grannying, I am glad to see these beautiful children go home with mom and, I wonder how I managed to run a home and do a comic strip at the same time! This entry was posted in Uncategorized on March 6, 2015 by stripfix. Lynn's Comments: During the few times I worked as my husband's dental assistant, I was fortunate to have two wonderful parents in law, living a mere 5 minute walk away (from both the clinic and the house). Ruth and Tom's home was set up for children and the care was constant as we moved the kids from one house to the other. At the end of the day, we might stay at "Ruth's" for dinner or we'd pick up the kids and come home--exhausted. Either way, it was "mom" who put on the grub! This entry was posted in Uncategorized on March 7, 2015 by stripfix. Lynn's Comments: I am a militant shopper sometimes. I sneer at able-bodied folks who park in the handicap zone, grumble when they squeeze all the tomatoes, and will audibly sigh if there's a long checkout line and some bozo decides to redeem a wad of coupons. On a busy weekend outside my favourite grocery store, someone had parked across the ramp. Shoppers couldn't get to the parking lot without heaving their carts over the curb. The situation I drew in this strip was based on this incident, but it has a different ending. I waited a minute, wondering how long this inconsiderate person would be. He certainly had to know that he'd blocked everyone's path. I had a couple of choice comments to make like, "Couldn't get any closer, hum?" or "The parking lot's THAT way!" Soon the doors opened and an elderly man appeared. He was helping a woman who was pushing a small, half-filled shopping cart. He smiled at me as he held her steady and eased her forward. "My wife had a stroke," he said, "this is her first time outdoors since she managed to walk again and she wanted to shop for groceries." I opened the passenger door and kept the cart from rolling forward as he lovingly helped her into the car. I then handed him their grocery bags as he loaded them into the trunk. He explained that he'd moved the car closer to the door for her and was sorry for the inconvenience. He thanked me sincerely as he worked himself into the driver's seat. As they drove away I thought to myself, "Thank heavens I didn't say anything!" It was another lesson; a good story--and I guess I didn't have the courage to tell it the way it was! This entry was posted in Uncategorized on March 8, 2015 by stripfix. Lynn's Comments: Letting my kids stay home alone happened rarely and only when I knew I could trust them! This meant not letting a bunch of friends in or digging into the liquor cabinet or calling someone in China as a prank. Another adult always knew where they were and had a key to the house. Still, Aaron's desire to hit the snacks before dinner was always a hazard of being home alone. I know the feeling. If there's a bag of Doritos in the house, it will go down before I heat up the leftovers. This entry was posted in Uncategorized on March 9, 2015 by stripfix. Lynn's Comments: Michael, being five years older than Elizabeth, was allowed to stay at home alone for a couple of hours after school--before his mother came home from work. The sitter (and good friend) lived next door and kept an eye on him, but still, I got complaints about this "unhealthy situation." This entry was posted in Uncategorized on March 10, 2015 by stripfix. This entry was posted in Uncategorized on March 11, 2015 by stripfix. Lynn's Comments: This isn't so much a scene from my son's adolescence, but my own. My parents both worked at our jewellery store and would be home around 6:00 pm. I was supposed to have the dinner on by the time they arrived--everything was set out for me and easy instructions were left on the counter. Even so, I thought it as the biggest imposition in the world; unfair, because my younger brother didn't have to do ANYTHING! Eventually, I started to have some pride in the fact that I could cook! This gave me some real confidence, since many of my friends couldn't even make a sandwich. This entry was posted in Uncategorized on March 12, 2015 by stripfix. Lynn's Comments: With both parents working, my brother and I stayed in the house after school by ourselves. We had strict rules of conduct and some serious responsibilities! We took pride in our roles, which made us surprisingly compatible. We fought less when we were unsupervised. Who would have guessed! This entry was posted in Uncategorized on March 13, 2015 by stripfix. 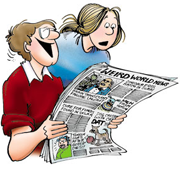 Lynn's Comments: The strip was starting to realistically show a family's weaknesses as well as its strengths, which I think made it more believable. I was trying to show real life: What happened to me and to the character, Michael, happens all the time. In an ideal world, I guess someone should be there to chaperone a child at all times, but like me, Mike was a responsible kid who was capable of helping out. Sometimes we could all use an extra hand to help make ends meet! This entry was posted in Uncategorized on March 14, 2015 by stripfix. This entry was posted in Uncategorized on March 15, 2015 by stripfix. This entry was posted in Uncategorized on March 16, 2015 by stripfix. Lynn's Comments: Like other twists in the story line, this revelation came as a surprise to me. I had no idea that Ted had been interested in his receptionist/secretary! The neat thing about Irene was that she took Ted away from Connie. Connie could move on. Irene had a "throw-away" part; her character didn't need to be rounded out. I invented a character I could play with for a while and then ignore--the kind of role in which an actor would hate to be cast! This entry was posted in Uncategorized on March 17, 2015 by stripfix. This entry was posted in Uncategorized on March 18, 2015 by stripfix. Lynn's Comments: The frustrating thing about being a writer (which I am to a small degree) is that my imagination works over time. If I need to talk to someone about an important matter or if I've done something for which I should apologize, I have the conversation a hundred times--in my head. I make my own arguments, answer my own questions and before the conversation ever takes place, I have worked it to death--ad nauseam. Most often, I beat myself up over trivial stuff that is easily resolved. I imagine every possible scenario. When the confrontation does take place, I have blown the situation so far out of proportion that the person I am talking to has no idea what I'm so worried about! Oh well, there's nothing like being prepared for the worst! This entry was posted in Uncategorized on March 19, 2015 by stripfix. This entry was posted in Uncategorized on March 20, 2015 by stripfix. Lynn's Comments: Here, I've created an "Everest of woe". I can't see past an infraction until I've confronted the offended party and apologized. This entry was posted in Uncategorized on March 21, 2015 by stripfix. This entry was posted in Uncategorized on March 22, 2015 by stripfix. Lynn's Comments: My mother in law made the best cookies ever. I could never make them as well, because I can't seem to stick to a recipe. First of all, I hate to measure. It means extra time and extra utensils. I like instructions which say "a dash of this or a knob of that." When it comes to dinner, I'm a fairly good cook, but when it comes to the finer things like cookies and cakes, I defer to those who follow directions. This reminds me: my grandmother, when asked how she measured molasses would say: "two golollups and a drip". I loved that expression! This entry was posted in Uncategorized on March 23, 2015 by stripfix. Lynn's Comments: Some of the best events I got myself into were the ones for which I was "volunteered". Because I couldn't say "no", bake sales, costume sewing bees and skating festivals were all part of my time in Lynn Lake Manitoba. Some of my favourite memories are of these of bee-hives of activity in the company of other moms trying to do everything for everyone all of the time! This entry was posted in Uncategorized on March 24, 2015 by stripfix. This entry was posted in Uncategorized on March 25, 2015 by stripfix. This entry was posted in Uncategorized on March 26, 2015 by stripfix. Lynn's Comments: This is one of my favourite punch lines. If you can work a famous line into a gag, it's very, very satisfying. This entry was posted in Uncategorized on March 27, 2015 by stripfix. Lynn's Comments: This kind of teasing came from my dad who loved to twist fairy tales and embellish stories. Easter was a good time for story-telling. My brother and I looked forward to Easter as soon as Christmas was over. We didn't have a lot of commercial decorative stuff when I was small, so we made our own. Every Easter, dad would find the right sized cardboard box. This we would decorate with crepe paper, (remember that?) drawings, ribbons and tulle. Whatever we could find went onto the box to make it attractive to the E. bunny: a nest for the goodies he'd bring! The decorated box would be left in the living room the night before and on Easter morning, it would be filled with things like big chocolate bunnies, fluffy pom-pom chicks, jelly beans and a few small toys. After we went through the bunny box, my brother and I would search the house for coloured hard-boiled eggs--and there was always one in the bathtub plug hole. Great memories come from such simple things. This year, my granddaughter is old enough to make a bunny box--and I have one, just the right size! This entry was posted in Uncategorized on March 28, 2015 by stripfix. This entry was posted in Uncategorized on March 29, 2015 by stripfix. Lynn's Comments: There was a song: "June is busting out all over" and I think it came from a big Broadway musical. Someone out there will tell me! Anyway--a neighbour of ours (whose name was June) had told my mom, in secret, that she was expecting. Mom was asked to keep it quiet until June knew for sure. In a weak moment, mom told my dad--who was always thinking of puns, gags and ways to crack people up. When dad came upon my mom and her friend talking over the fence, he started to sing "June is busting out all over" and the look on the ladies' faces was a cartoon waiting to be drawn. Both had their mouths open in that tense little "O" of surprise. Dad was in the doghouse until June was sure of her condition. All was forgiven and baby Alex busted out--red and healthy six months later. This entry was posted in Uncategorized on March 30, 2015 by stripfix. This entry was posted in Uncategorized on March 31, 2015 by stripfix.